PowerPath’s value fundamentally comes from its architecture and position in the I/O stack within the host. •At a first level, PowerPath sits above the HBA allowing heterogeneous support of operating systems and storage arrays. •Next, by integrating with the I/O drivers, all I/Os run through PowerPath and allow for it to be a single I/O control and management point. •Finally as shown here, PowerPath also sits below the application level, database level, and file system level. This combination allows it to be an infrastructure manageability and control point. Sitting below the host servers allows PowerPath to work with any raw devices, volume manager, or file system, and to be the basis for path management rather than just multipathing. •The EMC PowerPath family includes PowerPath Multipathing for Windows, Linux, Solaris, HP-UX, and AIX physical environments, as well as Linux, AIX, and Solaris virtual environments, and PowerPath/VE Multipathing for VMware vSphere and Microsoft Hyper-V virtual environments. •Optimizes load balancing, eliminating cumbersome manual I/O load balancing. •Grow without worrying about I/O flow and bottlenecks. Eliminate the impact of I/O failures on application availability and performance. 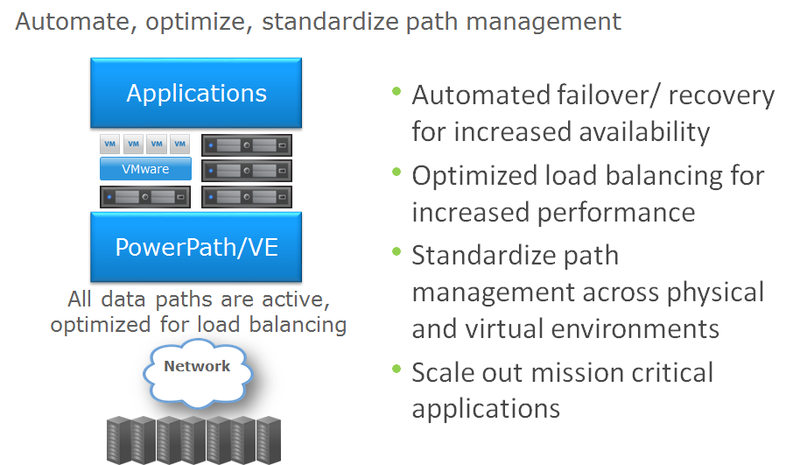 •Standardize path management. PowerPath applies the same tool set and patented algorithms across physical and virtual environments to reduce the number of tools necessary to optimize data paths. Additionally, with PowerPath Viewer, you can monitor all PowerPath-supported devices from a single pane of glass. •Scale out mission critical applications. 3. NetApp (no, really! ), PowerPath/VE 5.9 for VMware vSphere supports NetApp FAS2240 storage array models only. ant other netapp array will require RPQ. Previous Post Previous post: Virtual Storage Integrator 5.6 Is GA!, Grab It While It’s Hot. Next Post Next post: Horizon View Large-Scale Deployment White Paper Is Now Available! 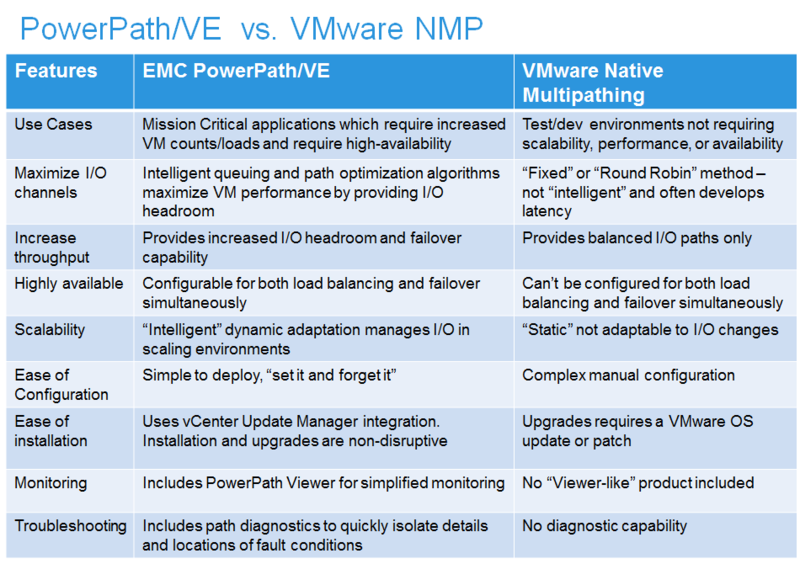 Is powerpath support for Netapp on VMware only ? Linux and Windows supported as well ?